The month of September is best known as the patriotic month, since it celebrates two important dates such as the September 14 which commemorates the Battle of San Jacinto and 15th the celebration of Central American independence. 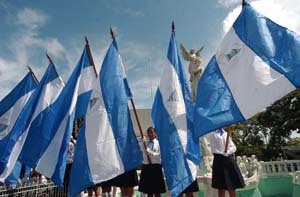 The whole country wears blue and white in honor of the fatherland. To start the festivities the first week take place an official act with the presence of government representants, Central america ambassadors and student community with their respective rhythmic bands. Another highly symbolic event is the lighted torch, which crosses all Central America, reaching Nicaraguan border on september 11th through the border Las Manos, is passed from hand to hand to a maximum of 100 m by the best students and other personalities. The torch is received on September 12 at the National Palace of Culture. Also institutions participate in this memorial act, such as the army of Nicaragua who executes a masterful presentation, for a long time the celebration took place on the national baseball stadium Denis Martínez. On September 15th take place the reading of the Declaration of Independence of Central America in every school in the country, accompanied by an actl where is presented traditional dances, poems and songs alluding to the Fatherland. Some schools hold parades through the streets of their neighborhood with rhythmic bands.